What Are Signs That Kittens Give Off to Show That They Are Happy? 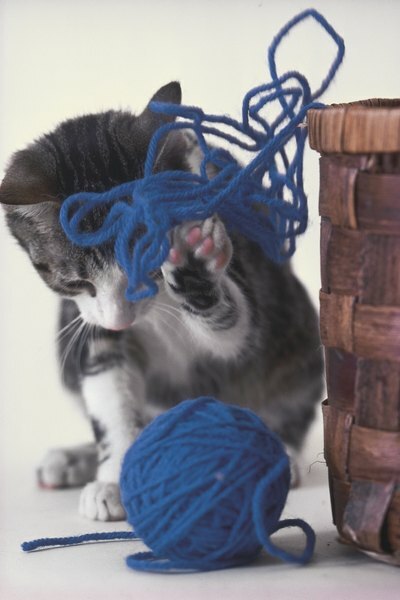 Happy kittens love to play. Few things are as relaxing as cuddling with your new furry addition at the end of a long day. Your kitten will let you know when she's happy. She'll make all kinds of noises, be affectionate and want to play with you. These are signs your feline is content and healthy. Odds are when you get home, your kitten rubs up against you and purrs loudly. Although the exact reason for purring is unknown, several theories grapple with this question. Kittens learn to purr from their mother and use it as a way to communicate. Since young nursing kittens cannot meow while feeding, they'll purr to let their mommy know that they are safe and satisfied. The mother cat often reciprocates by also purring to relax her young ones. This behavior sticks with kittens throughout their entire lives. When you pet your feline friend, she'll purr to alert you that all is well, assuring you that she is happy. Your purring pal may lick you when she's happy and excited. Cats lick as a social behavior to share scents, as well as to clean each other. When she feels comfortable with you, she'll lick your hands, face, feet or other visible area. She's covering you with her scent as a way to claim or take ownership of you, making you her territory. Additionally, she's removing debris off you, just like she would do with her beloved littermates. Licking is a true sign of love and affection. Playing with Princess allows her to bond and build trust in you. While frisky felines are perfectly capable of entertaining themselves, you are their master and they want to play with you. And if she's been alone all day, she needs some special attention. Interact with your new addition by purchasing a variety of toys and figuring out what interests her. 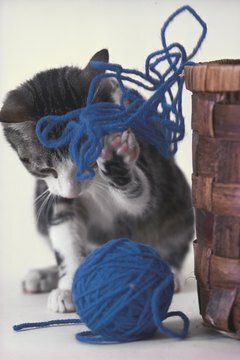 Kittens love to chase feathers and small pieces of cloth attached to a long stick or to chase a small ping-pong ball across the kitchen floor. When your little fluff ball feels comfortable and happy with you, she'll be more inclined to play with you. One of the ultimate signs that a kitty is truly happy is when she cuddles up with you. She can lay anywhere in the house and she chooses to grace you with her presence and snuggle up with you. As soon as you sit in your favorite recliner, she'll jump up on the highest part of the chair, rub her face against yours and then snuggle in your lap. Often this behavior is accompanied by loud purring, soft meows and even head butts. The combination of behaviors lets you know that your feline has bonded with you and she is beyond happy to be a part of your family. Doctors Foster and Smith: Why Do Cats Purr?